This is my new favorite t-shirt! The steps used to create this one are the exact ones you see below, but using the first t-shirt I attempted. Lately I've been all about graphic t-shirts, but I've also been all about saving money. And because I don't own a Cricut or a Silhouette machine, I can't make cute vinyl t-shirts with my own lettering/designs like I see so many of my crafty friends doing on Instagram! Less is more! Plain and simple is best...especially because we're using a hand-made stencil for this project. A single statement word or a very simple phrase will not only look the best in the end, but will be the easiest for you to design and then cut out. Since you'll use an Xacto knife for this project, you also want to avoid styles with thin lines or small details. Big, bulky lettering and well-spaced words are best! You can obviously use your own lettering, but there are a ton of great, free fonts here that you can download and use for your custom t-shirt. I hand-lettered both of the t-shirts you'll see in this post, but the white t-shirt was by far the success in this story. The one I use for the step-by-step process was a little toooo complicated of a design for me, which is why I am not modeling it in the end. Now, let's talk about choosing a t-shirt. I got mine at Wal-Mart for $2.88--super cheap! They had the best color variety in a fitted style, but because I don't love a super fitted shirt, I sized up to get a looser fit. For my next shirt, I will choose a different style all together. 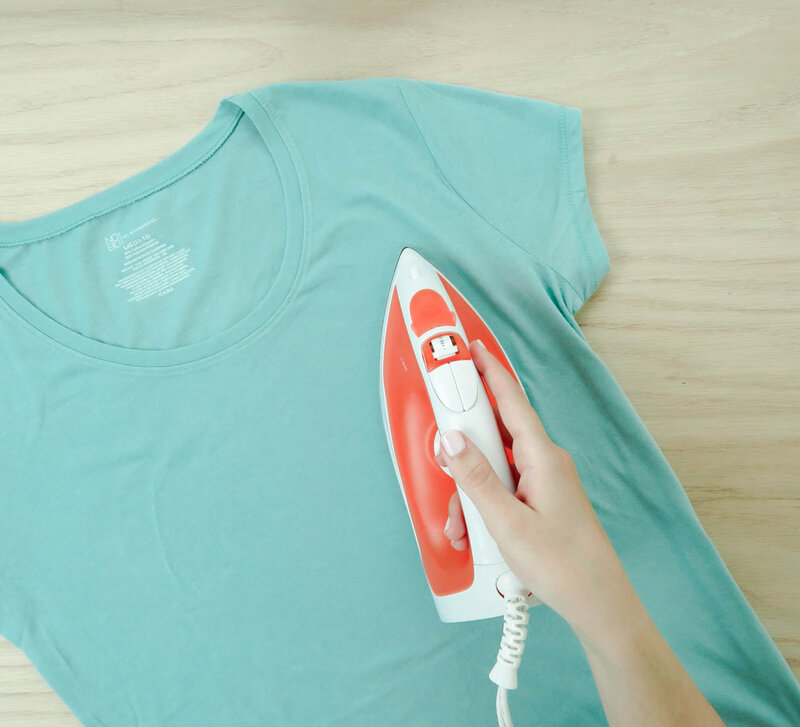 Before designing anything, lay your shirt out on a flat surface and give it a good iron. Get all the wrinkles out so you can measure where you want your design to be. I used a ruler for this step, and used other graphic tees in a similar fit to gauge where my design should go. I highly suggest using another t-shirt in your wardrobe to compare with your DIY t-shirt. It takes a TON of the guesswork out. Once you know measurements, you can begin designing. I chose the phrase 'dreams unwind' (Stevie Nicks, anyone?) for my first ever t-shirt design (too lofty of a design for my first one) and got started sketching in my iPad Pro to design the shirt. I set up an artboard that would be the right size. From there, I sent the design to my computer and printed it out on my printer on a piece of cardstock. Then, I got to cutting with my Xacto knife. If you don't have an iPad or another digital drawing device, you can always use a pencil and pen to design right onto a piece of cardstock. You need to save the little 'inside' pieces of the letter cutouts (those are the little pieces I have off to the side). Like I said, this was a VERY lofty design for my first try...the white shirt you see in pictures above had a WAY simpler design and turned out much better than this one. Learn from my mistakes! Next, I taped my paper onto the shirt where the design would go. Using cardstock is especially important because you don't want the fabric paint to bleed through your stencil onto the shirt. You want your stencil to hold up through this process! You want to tape your design onto the shirt as close to the edges as possible so you avoid the paint bleeding out anywhere you don't want it to go. When you apply the paint, you'll want to press down on the stencil to make sure it is laying completely flat on your shirt. I had decent luck with this! You will also want to attach the insides of your letter cutouts to the shirt. I used a tiny dot of tape for this. Before you apply any paint, place a piece of cardboard inside your shirt, below where the design will go. If you don't, your paint will bleed through both layers of your shirt. Ok, so this is how it turned out. I used a detail brush to clean up the edges, but over all....not great. This is when I realized I needed to SIMPLIFY my design big time. And that's how my second try came to be my successful one. I hope you enjoyed this tutorial for a DIY custom t-shirt! I had fun making it, learned a lot, and have a super cute t-shirt in my wardrobe that cost me about $5 to make! Total win! Let me know if you'll be trying this one anything soon. + download my free worksheets! Your inbox is sacred. No spammy, icky e-mails from me. You're the bomb. Check your inbox to confirm your subscription, and download the practice sheets!